Every store front needs some window graphics to let people know who you are and to pull them into your store. A little information about who you are, what you sell and some contact information will go a long way to get customers. Not to mention, making your store more inviting. We do both window graphics and door lettering. Installation can be included in the price. We will even make a scaled drawing to get approval from the city, for free. 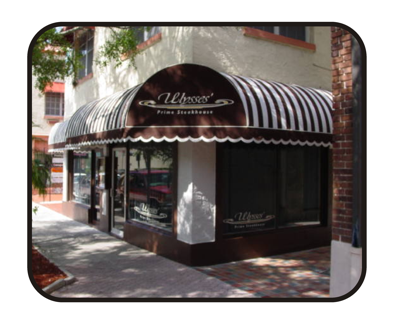 All Awnings are custom made. Available in a wide variety of styles and colors to match any theme your store has. Prices include installation. We can letter you awning with your name, number and or street address. Every awning is different so each job must be quoted individually. Give us a call at, 407-322-2923, and we will be happy to send some one out to you to collect all the information for an accurate quote. Available in plastic, aluminum and steel, replaceable sign faces and dry erase surfaces make it great for changing information. These are great for restaurants to put their daily specials on . You can also use it to alert passersby about upcoming events and promotions that might interest them. Pull in customers by exciting and enticing them as they walk by!